Can you escape from the 9th Dimension? Who knew that the Mensa Select committee would pick a game that generates tons of laughs every time it hits the table? Yes, Gravwell will make you think as well as laugh. 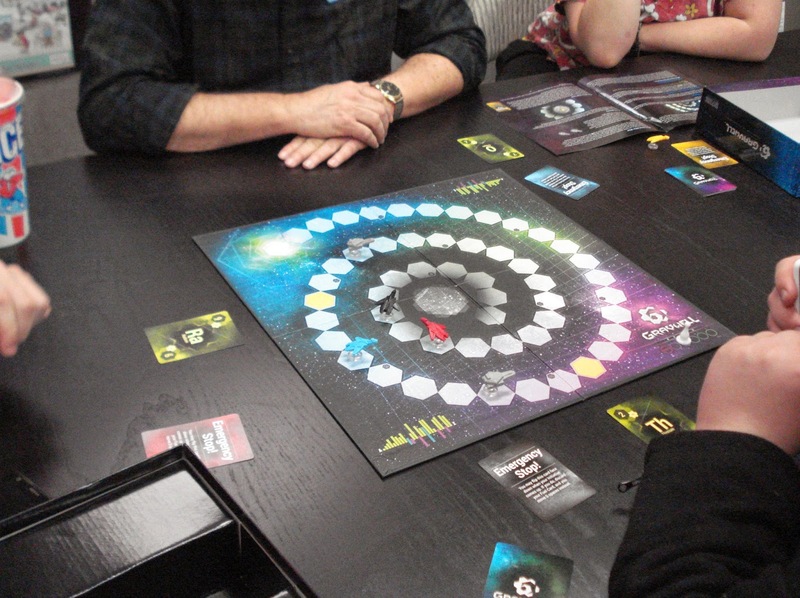 The objective in Gravwell is to be the first to pilot your spaceship from the singularity of a black hole to the warp gate. Along the way you will have to deal with the devious maneuvers of your opponents and a couple of wayward derelict ships. Each round begins with a quick card draft. Each player will select 3 sets of 2 cards creating a hand of 6 cards. During this selection process each set of cards will have one card face up and one card face down. Next, players will simultaneously select a card from their hand and place it face down on the table in front of them. Now the fun really begins. Each card is depicted with an alphabet chemical element symbol and a thrust value. The chemical element symbol will dictate player turn order with the card closest to the start of the alphabet going first. There are 3 types of movement cards. Green-faced cards propel your ship away from the closest ship. Purple-faced Repulsor Ray cards will propel your ship away from the closest ship. Teal-faced Tractor Beam cards will pull all other ships toward your ship. When you select cards at the start of the alphabet you can maneuver your ship to be where your opponents might not expect you to be. When you select a card with the end of the alphabet you will want to determine where your opponents’ ships will be when it’s your turn to move. When you have cards in the middle of the alphabet, well good luck! The derelict ships always seem to be on the wrong side of your ship. Your opponents, if not normally devious will soon become that way. Gravwell may be a 2014 Mensa Select Winner for the need to psych out what your opponents are up to, but I like it because it rates really high on laughs per minute. 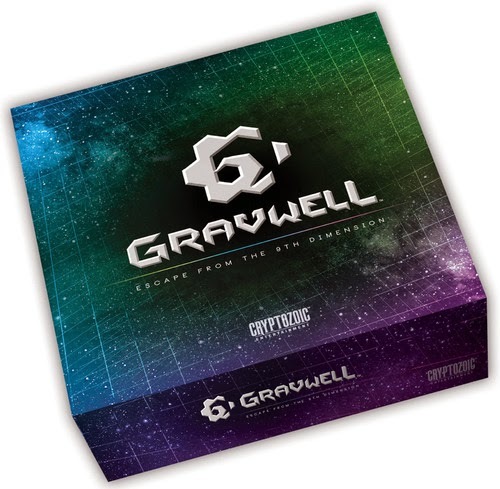 We have an open copy of Gravwell is available in our Store Demo Library for you come in and try out.